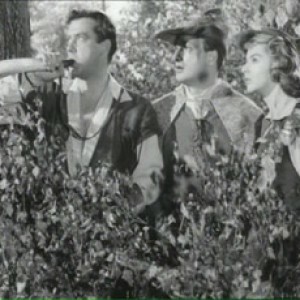 Richard Greene, sounding alarm in Sherwood Forest, in the Robin Hood TV series. Let’s get to the “real story” of Richard, John, and Robin. And yep, here’s where’s John’s treachery becomes repugnant. With Richard being held hostage in Germany, John and King Philip Augustus of France made last-minute counteroffers to keep him in captivity — 1,000 pounds a month, or release him for 100,000 pounds. “See how much they loved him,” said Roger of Howden acidly. But the Holy Roman emperor, Henry VI, after being rebuked by the bishops and princes for trying to break out of the deal to set Richard free after his ransom had been paid, set him free on February 4, 1194. Richard was back in England in about six weeks. Where was John’s strength greatest at that moment — Nottingham. Once the castle there surrendered, the angry king declared his brother “had occupied his castles, laid waste his lands on both sides of the sea, and made a treaty against him with his enemy, the king of France.” Richard, aka Richard I in English monarchy counting, gave “Count John” forty days to show up or forfeit “any future claim to the kingdom.” John at the time was working with the king of France capturing castles in other parts of England. When Richard finally caught up with his younger brother, the “real” king attributed all the mischief to John’s being a child left with “bad guardians” and gave him the kiss of peace before serving him salmon for dinner. But “Bad King John” wouldn’t abide by its terms — the numbered clauses of his deficiencies come from Sir William Blackstone centuries later, so there were several versions of what had been agreed to at Runnymede in 1215 over the next several years. The Library of Congress this year displayed the “Magna Carta” on loan from the Lincoln Cathedral in the United Kingdom and drew huge crowds. In the United States, the National Archives also holds a 1297 copy of the Great Charter. Now getting back to the late Richard. When I toured the Rouen Cathedral in April and saw a raised stone effigy of Lionheart, I was really surprised — even more surprised than I was to find the Shrine of the Maji, an important element of the Christmas-Epiphany story, in Cologne’s Cathedral. As legend goes Emperor Constantine’s mother, who also discovered “the true cross,” [a busy and pious woman of the first order] brought the Majis’ remains to this far outpost of the Roman emperor. The guide at Rouen was not kind to Richard either as a king of England or duke of Normandy. He had even worse things to say about John, except his losing so much of his cross channel holdings to the king of France, which the guide favored. The guide’s English was fluent, right down to American idiom and most of us were from the United States. That’s more than likely can be said about the Lionheart or John or their court. They spoke Norman French. Not a Saxon in the “real” story — except to pay tribute and taxes. Old English, Middle English were as foreign to their rulers’ ears as Welsh and Irish celtic. There is a even a coda to the coda because, well, not all of Richard is at Rouen — but his embalmed heart is. That is central to this story. I read later that his entrails are buried at Chaldus where he died. And we’re not done yet. The rest of his body is at Fonteraud Abbey, at the foot of his father’s, Henry II of England, grave. What would Maid Marian — in Scott’s version — say about that? As for Richard Greene, before World War II, he was a star in his own right — certainly in Great Britain. 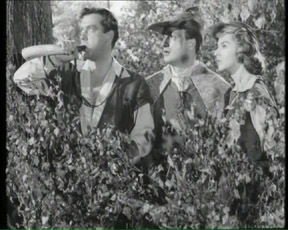 The year after Flynn’s Robin Hood appeared, Greene played Henry Baskerville in the “dog story,” The Hound of the Baskerville, with Basil Rathbone playing another British immortal fictional character — Sherlock Holmes. Hound was the first of the 14 Holmes’ movies produced by Fox and Universal through 1947. Rathbone too has a tie to Richard, John, Robin, Maid Marian, Little John, Friar Tuck, etc. He played the evil Sir Guy in the Flynn epic. His performance is often cited as his best villain role.